A component that performs (some) portion of the query processing by returning the tuples that result from this stage of processing. Processing components are designed to be assembled into a processing structure, with a single component at the top that returns the results of a query. Interface for evaluating a DynamicOperand to return the resulting value. Close these results, allowing any resources to be released. 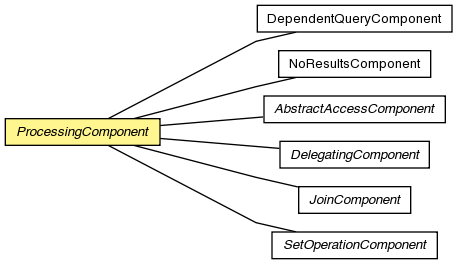 Create a ProcessingComponent.DynamicOperation instance that is able to evaluate the supplied DynamicOperand. Utility method to create a new tuples list that is empty. Get the context in which this query is being executed. Get the container for problems encountered during processing.